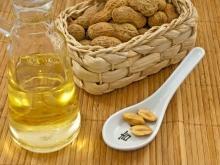 Many studies have shown that fats are the main culprits for most of the diseases and afflictions of modern society. Equally, even more professionals are adamant that olive oil is the fat that we must choose and consume daily. The reason for this is that olive oil can certainly be described as a kind of medicine for the body. Because many modern studies show that the systematic use of olive oil prevents us from a range of severe diseases, it preserves our health and prolongs our life. Olive oil is a vegetable oil that is extracted from the fruit of the olive tree. This golden liquid is present in the lives of people for centuries - whether as a therapeutic agent, a beauty treatment or culinary product. The cultivation of olive trees happened for the first time out on the shores of the Mediterranean and has its roots thousands of years back. Olives and olive oil are deeply connected to the feeding of the people in this region. In ancient Rome, olive oil had been an integral part of everyday food. Romans imported it mainly from Spain. Olive oil has always been appreciated and enjoyed in the rites of anointing of kings and priests. 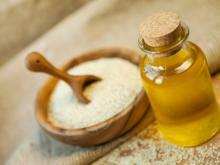 Hippocrates advised people to use olive oil for personal hygiene. Greeks invented the first soap by mixing a few drops of oil, talc and ashes. Hippocrates, Pliny, Galen and many other ancient healers marked immutable properties to olive oil, calling it magical. Olive oil contains between 55 and 80% mono-unsaturated oleic acid, between 4 and 20% omega-6 fatty acids and 2% monounsaturated omega-3 fatty acids. 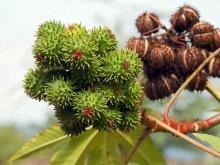 It contains about 15% saturated fat, vitamin E, which plays an important antioxidant role. Other vitamins found in olive oil are A and D. It is rich in many minerals - calcium, potassium, magnesium, carotene. 100 g of olive oil contains 85 g unsaturated and 15 g saturated fat and 900 calories. On the market there are different types of olive oil, as the undisputed champion of good qualities and impact on the human body remains cold pressed olive oil. It is not subjected to any heat or chemical treatment. Extraction, as the name suggests, is from the cold pressing of exceptional quality olives. This type of olive oil is pure, unadulterated and helpful in every way. 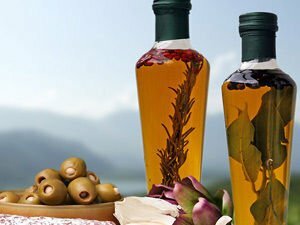 Virgin olive oil, known as Extra Virgin, contains two kinds of valuable fatty acids in the optimal ratio - 80% oleic acid and 10% linoleic. It also is a source of vitamins A and E, known as the "vitamins of eternal youth." Virgin olive oil has low acidity. 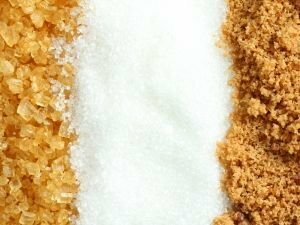 It contains more than 1% acids (ie 1 g acid per 100 grams of fat). This is duly noted by manufacturer labels. Raw extra virgin olive oil is absorbed completely, because it is very similar to lipids in the body. 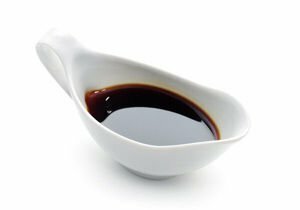 For comparison, sunflower oil, for example, is absorbed only at 83%, and Chinese cuisine using the hot sesame oil is absorbed only at 57%. 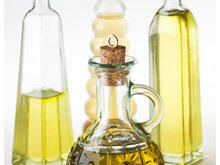 Oleic acid, which is found in virgin olive oil, protects the heart and arteries. Virgin olive oil supplies our body substances that resist the oxidation processes in it. In parallel, it maintains cell membranes in optimal condition. The disadvantage of extra virgin olive oil lies in the fact that it should not be heated because you lose some of its characteristics. It is advisable to use it mostly for salads. If we decide to cook with olive oil, we must use pure olive oil, but one marked "100%" on the label. This oil is relatively clean, but it can and must be used in all kinds of cooking. The next type of oil is Virgin. Obtained after the second or third pressing of the olive paste, once the oil first grade is extracted. It is the same kind of oil as the previous and the result is only a product of cold pressing technology. Pure Olive Oil - is known as olive oil for industrial use. Refining is with heat, high pressure and using different solvents. 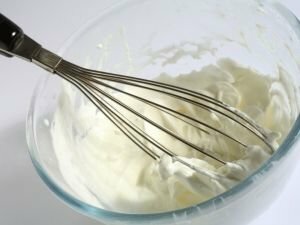 During the technological process, it loses much of its natural flavors and is thus only used for frying, but not for salad dressings. When buying olive oil, the first and most important step is to look at the date of production. Storage in cans is 3 to 4 years, and in bottles - up to 1 year. Olive oil is very easy to fake, so we need to know that when real oil stored at a temperature of 0 degrees, it becomes thicker and darker, while other fats do not change their state. Keep olive oil in a dry and dark place at a temperature no higher than 20 degrees. Most suitable for preservation is glassware. 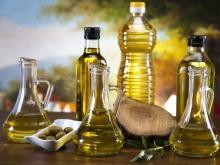 Olive oil, which is produced in the period from November to January can lighten with long storage. This should not bother you because it's completely normal. Olive oil is one of the main ingredients of the famous Mediterranean cuisine. 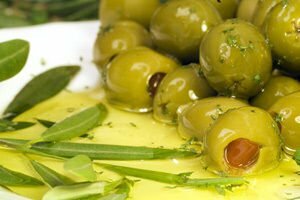 Olive oil is used to flavor many dishes, salads, and cold appetizers. It is used for frying and baking. 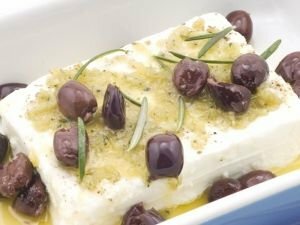 Extra virgin and virgin olive oil are ideal for dressings and sauces as fresh, or can be used for frying. Use olive oil whenever you want to give a thick edge to a dish, no matter what it is - fish, meat or vegetables. Daily use of this oil is much more conducive to health than conventional oil. Healing properties of olive oil are determined by its composition. Olive oil is rich in polyunsaturated fatty acids and features rare monounsaturated essential fatty acids. The unsaponifiable group of nutrients in the olive oil consists of theron that blocks the absorption of dietary cholesterol from the intestine, tocopherols, which have the properties of antioxidants, terpenes that contribute to the secretion of bile acids, carotene, which also has antioxidant properties, phospholipids - the main components of cell membranes, particularly the membranes of neurons, estrone - estrogenic hormones. 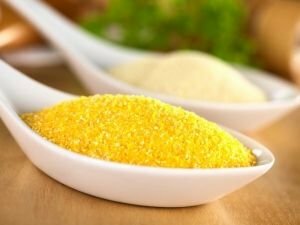 vitamin A, known as an antioxidant; Calciferol ( vitamin D), which enhances the absorption of calcium in the intestine, flavonoids involved in redox reactions in the body; chlorophyll, which gives the oil its beautiful green color and stimulates the growth of cells, especially red blood cells and leukocytes. Olive oil has an incredible beneficial effect on a person. 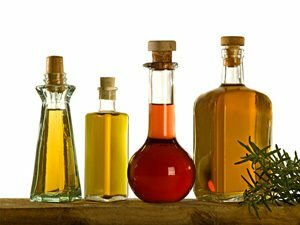 It has been shown that the use of 3 tablespoons of olive oil a day helps reduce the risk of disease from rheumatoid arthritis 2.5 times. It was found that olive oil has a healing effect in the treatment and prevention of cardiovascular diseases. With its help, you can significantly reduce levels of "bad" and increase "good" cholesterol. 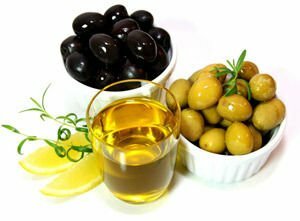 Olive oil helps to reduce the intensity of oxidation, normalize blood pressure, increase the elasticity of the artery walls and reduce the risk of developing thrombosis. 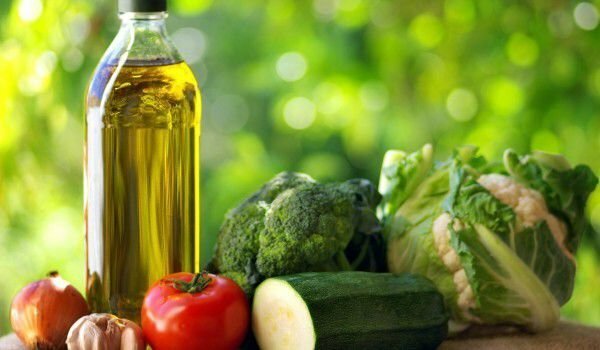 According to American scientists 1 tablespoon of olive oil per day in parallel to reducing the use of other fats helps the risk of breast cancer fall by 45%. Studies were made over four years. They involved more than 60, 000 women aged 40 to 76. Olive oil is able to retain our youth, as it slows down the process of aging in the body. 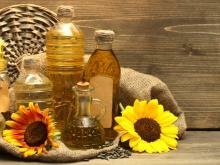 Experiments showed that mice that were fed with olive oil, lived longer than those fed sunflower or corn oil. The same is observed in humans, evidence for this comes from the people of Crete. They are popular with the production and daily use of olive oil for which their life expectancy is one of the highest in the world. In addition to having a number of useful properties for health, olive oil is one of the best keepers of natural beauty. 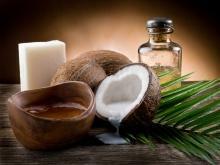 Because of the large number of antioxidants in it, the oil is used in beauty products since time immemorial. In ancient times, women are smearing their bodies and hairs with oil, believing that it is a true fountain of youth. It can be used in both hot summer days and the coldest winter months because it soothes. 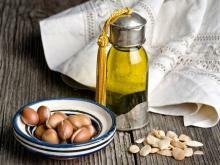 Olive oil is the basis of many cosmetic products because it has a natural ability to hydrate, strengthen and nourish. It adds shine and elasticity. Therefore, it can be used alone or in various combinations for each body part.